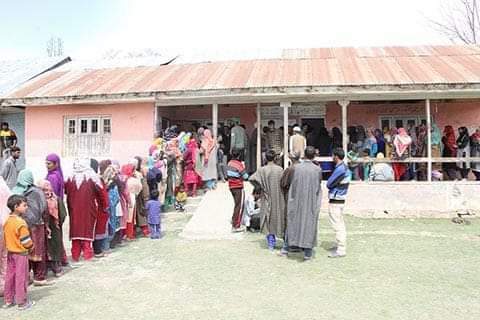 Srinagar: Out of a total of 111928 voters in north Kashmir’s Sopore, only 4864 cast their vote on Thursday in the elections to the Baramulla parliament constituency. Out of them, 3209 were male voters and 1655 were females. Going by the figures, Sopore recorded lowest voter turnout in north Kashmir with a percentage of 4.35. In Jagir Ghat and Dooru villages, people as usual remained away from polling stations. The two are the native villages of Muhammad Afzal Guru and Syed Ali Shah Geelani, respectively. 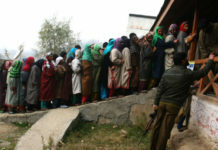 In Jagir Ghat Sopore, no one even walked towards the polling station on Thursday. Men huddled outside shops to discuss the current affairs and women preferred to stay inside their homes. Only media men and security personnel were seen near the polling stations. “Why should I vote and what for? I never cast my vote throughout my life, and I thank my villagers for staying away from the poll process,” one of the relatives of Afzal Guru said. 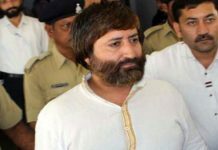 According to reports, not a single vote was polled in the native village of Muhammad Afzal Guru who was hanged in Delhi’s Tihar Jail on February 09, 2013. “Afzal was like my son. 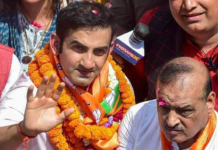 I can’t betray him and vote,” a neighbour of Guru said. Similar situation was witnessed in the native village of Hurriyat Conference (G) chairman Syed Ali Shah Geelani. In Dooru, People stayed away from the parliament polls and villagers were seen busy with their daily chorus. Several youths protested outside a polling station set up at the local panchayat ghar and pelted stones on the security forces in which one paramilitary trooper sustained minor injury. “We don’t vote and we will not vote. We support the boycott call of our leader,” one of the youths said. The poling staff waited for the whole day but not a single vote was cast out of the total 2718 at the three polling booths set up in the village. In Sopore town, minor stone pelting was reported in various polling booths including at Jamia Qadeem. Youths pelted stones on polling staff in which one employee Bashir Ahmad Ganaie sustained injuries. Brath Kalan village also recorded zero voter turnout. According to police, numerous youths of the village have joined militancy since 2016 agitation. “We have seen innumerable funerals of our young boys, how can we vote?” said a group of residents.